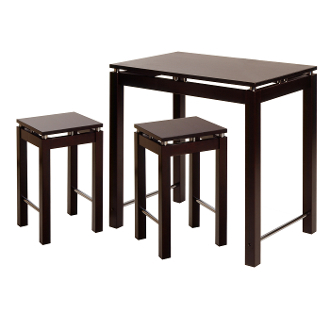 This 3pc Kitchen island Table with stools, feature a large table in espresso finish with chrome accent. Sit on this great look stools. Perfect for any kitchen. 3pc Set comes with Kitchen Island Table size is 35.5"W x 23.5"D x 34"H.
Two stools each stands at 13.77"W x 13.77"D x 22.87'H. This item ships in 3 Cartons.